While all of our loyalty and gift card programs work straight out-of-the-box, you may be looking for some additional components such as plastic cards or customized features/functions. We can help! While optional, tangible membership cards are a great way for customers to show their VIP status and increase brand awareness. Choose from many different styles of cards to capture the personality of your business. Select from magnetic stripe or barcode depending on your needs. Our card printing partners can help you get started. Communicate with your customers via our email marketing tools. Create a special promotion or coupon incentive to send to loyal members. Import segmented member lists into your email marketing platform or use our MailChimp® integration. Find out more about email marketing. Looking for something special or "outside the box"? Let us know your loyalty program objectives and we will do our best to accommodate. We also offer our API so your developers can integrate your loyalty program with your other applications. Provide your customers with an enhanced user experience through our Customer Web App. A responsive, customizable web-based app allows your customers to enroll themselves in your loyalty program, check their balance, history, redeem rewards, update profile information, earn points for Twitter® follows or Facebook® likes, and view custom content created by you! Are you a manufacturer who’d like to form a direct relationship with your end-customers, or a merchant who wants to drive additional traffic to your website? This promotional customer loyalty solution lets you generate unique codes which can then be distributed to your customers. Your customers can instantly redeem their codes in-store or online for loyalty points within your rewards program. You can control how many points each code is worth and easily track and manage codes through our loyalty program software. While not required to use with the program, you may want to consider obtaining a barcode or mag-stripe card reader to speed up the transaction process at checkout. Use a card reader via USB or Bluetooth to connect to a wide variety of devices. Already have a scanner? Ask us about cards that will work with your existing hardware. Download our free marketing documents to help promote your program in-store and online. Use our built-in customer transaction emails to send a thank you with a special promotion. Export your customer lists for additional email marketing. Looking for something different? Ask us to help! Integrate your Point-of-Sale (POS), website/shopping cart, social media accounts and more with our loyalty programs. Your developers can utilize our robust API to connect with a variety of applications. Click here for more info about loyalty integration. We offer the ability to white label our loyalty program software and make it your own. This is ideal if you're looking for a loyalty program to present to your client or utilizing a coalition style program for a "buy local" rewards campaign. Ask us about our white label and reseller options. Include your own branding for merchants accessing the web dashboard. Encourage foot traffic or allow customers to accrue points for signing in to a special event. With our Check-In loyalty solution, customers easily earn points by entering their phone number or swiping a loyalty card. Designed to work on almost any internet-enabled device (computer, tablet, kiosk, etc), the customer loyalty Check-In application not only provides an easy way for customers to take control of their point accumulation, but also acts as a mini billboard to advertise your services/specials. Create a customer kiosk for a do-it-yourself check in process in-store! 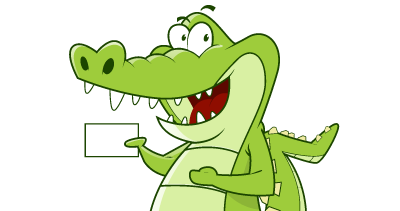 Loyalty Gator offers you more support, more control, and never any additional fees. No transaction fees, Free web support, Super secure data, Employee access control, No contracts! Gator start-up packages offer marketing materials so you can promote your new loyalty program in-store and on your website.